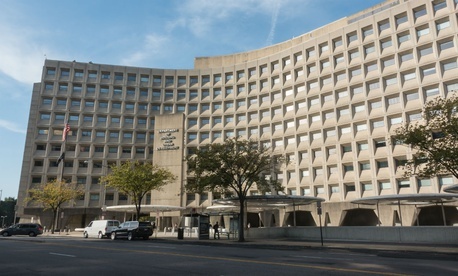 Officials at the Housing and Urban Development Department told federal employee unions last week that they must vacate government-provided office space by mid-July, a move that union officials say is an attempt to undermine collective bargaining negotiations. On June 14, the department issued a notice to the American Federation of Government Employees Council 222, which represents HUD employees, that it wishes to remove from AFGE’s existing collective bargaining agreement union employees’ right to HUD office space, phones, computers and other agency property by July 15. The proposal is intended to bring the department into compliance with President Trump’s recent executive order curbing official time, and it gives the union 15 days to demand to bargain, otherwise the eviction will move forward, the notice said. But union officials said the effort runs afoul of both the 1978 Civil Service Reform Act and the executive order HUD officials cited as justification for the eviction. The executive order states that it does not “abrogate any collective bargaining agreement [already] in effect,” and Holly Salamido, president of the AFGE HUD council, said unions are not required to renegotiate existing CBA provisions outside of full term negotiations. HUD spokesman Jereon Brown said the existing CBA “allows HUD to make proposed changes” and characterized the eviction notice as “simply” a proposal. But Salamido said the move smacks of an attempt to hurt AFGE’s ability to bargain. Labor and management are slated to begin ground rule negotiations on a new full CBA on Tuesday, a process that has been in the works since before the executive orders were signed last month. Any change to the collective bargaining agreement regarding union use of department office space and other resources should be done during the upcoming full CBA negotiation, Salamido said, adding that a “sarcastic” email from HUD Director of Employee and Labor Relations Joseph Sullivan suggests the move for parallel negotiations was not done in good faith. Salamido said the union is still weighing its options to fight the HUD eviction plan, but said filing an unfair labor practice may not be the most efficient option, because the Trump administration has not yet nominated a Federal Labor Relations Authority general counsel.